Curaçao is one of the five islands of the Netherlands Antilles in the Caribbean. It is located 40 miles off the coast of Venezuela, 42 miles east of Aruba, and 30 miles west of Bonaire. Curaçao is the largest of the five islands and the government of the Netherlands Antilles is located here. The island is about 62 km long and 14 km wide (4 km at its narrowest point in the middle of the island). About 150.000 people live on the island. The local language is Papiamentu (or Papiamento), the official language is Dutch, and English and Spanish are widely spoken. Curaçao is an island with many small and beautiful beaches surrounded by clear and refreshing water. 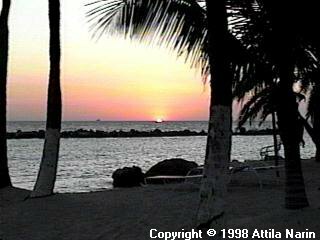 On August 23, 1996, Attila moved to Curaçao and lived there for about two years, leaving the island on July 18, 1998. Hopefully one day we'll be able to move back to this paradise. Beaches in Curaçao are small sandy bays with crystal clear water. On weekends many people go to the beach, but during the week you might find yourself alone on many beaches. Most beaches are located on the southern coast of the island and the water is calm. The northern coast is rocky and the sea is very rough. A few beaches are within minutes from the city, but most of them are in Banda 'Bou, the northwestern part of the island. Some beaches have restaurants and facilities (usually the ones that charge entrance), others are more simple. 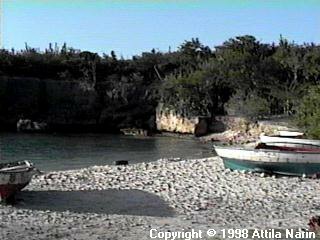 Some of the favorite beaches are Playa Knip, Cas Abou, Porto Marie, Playa Kalki, Barbara Beach, and Mambo Beach. Just about every beach is good for snorkeling and scuba diving. Scuba Diving is a breathtaking experience here. Curaçao is known for its underwater paradise consisting of coral reefs and sponge formations with thousands of colorful tropical fish. The water is pleasant and the visibility is excellent. Spear fishing, breaking or removing corals or shells is forbidden to preserve and protect the under-water life. Curaçao has over forty dive spots, some of which are only accessible by boat. However, many dive spots are accessible from beaches which allows for a nice combination of beach time and diving. Occasionally flying fish follow the dive boats and they sometimes fly next to the boat for several seconds. At the Seaquarium divers can enjoy encounters with stingrays, turtles, all kinds of tropical fish, and can even feed sharks and have their picture taken. Many dive operators and several diving schools offer their services: joining boat dives and renting equipment is not a problem; becoming a certified diver can be accomplished in a few days and courses are offered in many languages. Sightseeing on Curaçao comes in many flavors. Of course, beaches and scuba diving are one of the main attractions. The Seaquarium displays many fish and sea-life and the under-water observatory lets even non-divers observe the aquatic world. While driving out to Westpoint, a stop at Boca Tabla is highly recommended. Landhouses are worth a visit for their architecture and history, especially landhouse Brievengat, Chobolobo, and Knip. Many old buildings in Punda and Otrabanda have been restored and renovated and give a nice insight into the early settlers' lives. Curaçao is also the home of the oldest Synagogue in the Western Hemisphere and an old Jewish cemetery. 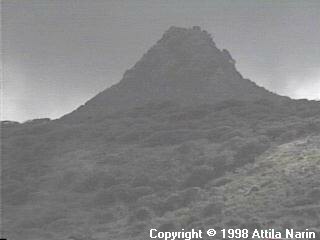 For hiking fans, the Christoffel Park is a nice but hot place to visit. A tour of the Curaçao Ostrich Farm will reveal details on how these giant birds grow up. The Hato Caves are a great place to learn more about Curaçao's geological history. Last, but not least, simply walking around in Punda, crossing the Emma bridge, looking at the waterfront, and observing people and their activities is a nice way to pick up the flavor of the Caribbean and Curaçao. Shopping in Curaçao is famous for its variety. Articles from Latin America, North America, and Europe can be found here. The main shopping areas are Punda, Otrabanda, and Saliña. Other nice shopping centers are Promenade and Bloempot. Sometimes it takes a little skill to dig out the best deals and to bargain for the best prices. Shoes, clothing, jewelry, tobacco, and watches are usually good buys here. The floating market is a good place to buy fresh vegetables and other things from Venezuela. Most stores are closed for lunch and also on Sundays. The local currency is the Netherlands Antilles Florin (NAF, sometimes called Guilder), and it is tied to the US Dollar (approx. 1.8 Florin = 1 US Dollar). US Dollars, Traveller's Checks and major credit cards are widely accepted. Nature Curaçao is the home of many lizards, iguanas and tropical birds. Wild goats can be found everywhere, out on the street and in peoples' neighborhoods. Since Curaçao is comparably dry, many cactus trees in all shapes and sizes are growing here next to Aloe plants and rough bushes. Curaçao is sometimes called Cactus Country. Curaçao is also famous for its Divi-Divi tree, the one that always grows in the direction of the wind. 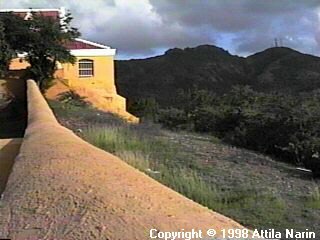 Curaçao has been built by a volcano, and the highest point is Mount Christoffel (about 300 meters high) surrounded by the Christoffel Park in the north-western part of the island. Climate The sun shines here most of the time and the average temperature is 82° F / 27° C. At night it doesn't get much colder than during the day, and in the winter it is hardly any colder than in the summer. The constant trade wind from the west is very important here since it keeps the island breezy and cool. Curaçao is fairly dry compared to other Caribbean islands and it is less tropical here. Located in the south Caribbean, Curaçao lies outside the hurricane belt. However, when storms are passing through the northern Caribbean, the wind in Curaçao will slow down and it will be less breezy. People wear casual beach and summer cloths all year around, but dress up when going out in the evening, especially in casinos, some restaurants, and for other events. In addition to providing shade, a hat, cap, or hair cover is generally not a bad idea since a fancy hairdo will not go well with the wind here (providing the hat won't fly away). Protection from the sun is essential for people not used to the vertical sun rays in regions closer to the equator. Hato Caves are limestone caves located close to the Curaçao airport. The cave has been commercialized in the early 90s and is now open to the public. Joining one of the hourly tours, visitors can enter the cave and learn more about Curaçao's geological history. The Hato Caves were formed below sea level thousands of years ago and as the water level dropped with the Ice Ages the cave became exposed. Like in other sea caves, shells and corals can be recognized in the stone. The cave is still active and stalactites (icicle shaped rocks hanging from the roof) and stalagmites (inverted stalactites on the floor) are growing to form columns. Flowstone and dripstone, curtain formations, lime ribs, and terrace formations suggest that the cave has been wetter in earlier times. Movements of the earth about 4000 years ago caused cracks (visible by lime deposits) and rocks fell down from the roof of the cave creating a small opening. This opening is used by the few hundred bats living in the cave to leave at night and hunt for food. Outside the cave Caquetios Indians carved Petroglyphs into the rock wall indicating that some of their religious ceremonies took place there about 1500 years ago. Boca Tabla On the northern side of the island the rough sea water has been smashing against the rocky coastline for centuries and has built several caves and little inlets into the rock. The most interesting one to see is probably Boca Tabla which is located close to Westpoint on the north-western end of the island. Visitors can walk over the massive volcanic rocks and observe the wild sea and listen to the wind. 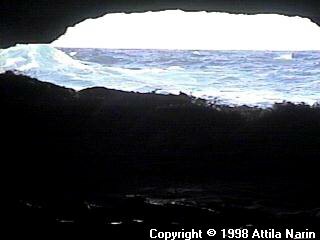 It's exciting to climb down into the cave to observe the waves clashing against its walls. On weekends simple but good local food is offered and people can sit in the cool shade of Divi-Divi trees and eat. Music is very important on the island. Starting in early days, the slaves here performed the Tambu in which they expressed their criticism and complaints. Today it can still be heard and people typically complain about increased taxes, high water prices, etc. Besides some European traits, the music here is mainly influenced by Latin and Caribbean styles. Popular music is typically a variation of either Merengue or Salsa, while more traditional music is usually a bit slower such as the Montuno or Waltz. The carnival music is Tumba (in contrast to Tambu), and once a year local bands will meet at the Tumba Festival to present their new carnival songs, one of which will be chosen to be the winner. Food is also very important on Curaçao, just like music. The local food includes delicious seafood, meats and side dishes. Some of the local sea food is Dradu (Mahi Mahi), Piska Kora (Red Snapper), Karko (conch meat), shrimp, and lobster. Kabritu Stoba (goat meat) is also a local specialty. Plantains (fried bananas) are usually served as vegetables or side dishes. Keshi Yena is also very delicious and means "filled cheese"; the cheese is filled with chicken, raisins, beans, and many other good things. Funchi is another specialty and is made out of corn; it's similar to corn bread and is usually fried like french fries. Another local specialty is Iguana soup. Typical side dishes are rice with beans, white rice, french fries, or baked potatoes. Carnival is a main event in Curaçao which usually takes place in late February. Many carnival groups come up with unique and interesting themes, colorful costumes, and large floats that they display during the parade. Preparations always start several months in advance. The carnival is not government funded and groups have their own way of raising money. One of the main fund raisers every year are the so called Jump-Ups that start in January. 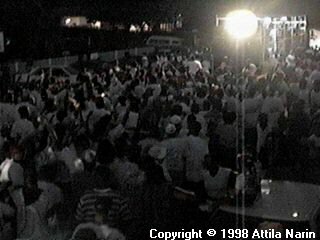 Bands on trucks playing carnival music followed by a dancing crowd move through the streets of Willemstad and party. Participants have to purchase a T-Shirt and get music, drinks, and fun in return. Most importantly, everybody is getting into the carnival mood and bands can practice their carnival songs for the year. The actual carnival parade usually takes several hours and is done twice, once during the day and once at night, resulting in two very different looking displays. Every year one of the groups participating is chosen to be the winner based on their theme and their appearance. 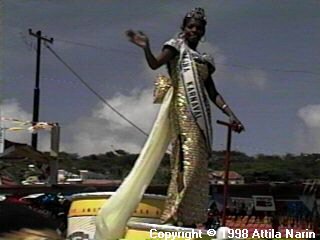 In addition to those groups, popular bands on trucks and drumming groups are contributing with live music, and floats with Miss Curaçao etc. are participating. Carnival is known to be the busiest time of the island since many international spectators come to visit. History Curaçao was discovered in 1499 by Alonso de Ojeda, a lieutenant of Christopher Columbus. The Spanish settled the island in the early 1500's. In 1634 the Dutch took possession of Curaçao and founded a Dutch settlement. Until the early 19th century, both the English and the French tried to take Curaçao. In 1800 Curaçao came under a British Protectorate returning to the Dutch in 1802. The British captured the island again in 1807 and it returned to the Dutch in 1815. Curaçao was always a place of racial tolerance and religious freedom, and Catholics, Protestants, Jews, and Moslems all have their own houses of worship. In 1954 the six islands Curaçao, Aruba, Bonaire, St. Marteen, St. Eustatius, and Saba became autonomous and formed the Netherlands Antilles. Today the Netherlands Antilles are made up of only five islands since Aruba became independent as of 1986. Both, Aruba and the Netherlands Antilles, are still part of the Dutch Kingdom. Landhouses on Curaçao date back to the 17th and 18th century, the time of plantations and slavery. Curaçao has about 70 landhouses, all displaying the typical Dutch architecture found on the island. They are strategically located on top of hills to oversee the plantation and to maintain visual contact with each other. This allowed for communication in case of emergencies. Today these landhouses are mainly in private hand, and some of them are carefully restored and open to the public. Some of the more famous landhouses are Brievengat, where a lot of music and cultural events take place, Knip, displaying antique furniture, household items, and telling a bit about its history, Chobolobo, where the Blue Curaçao Liqueur is made, Ascencion, Jan Kok, Zeelandia, and Groot Davelaar. Transportation on Curaçao is provided by buses, mini-buses, taxis, and ferryboats. Mini-buses are especially popular since they are quick and comfortable. The main bus stops are Punda and Otrabanda, and just about every spot on the island can be reached from one of these two centers. Upon request and for a few guilders more, a bus driver might even drop you off in your neighborhood or in front of your house. Taxis are the more expensive option. They do not have meters installed and the prices are fixed. Many hotels and resorts also have their own shuttle service. When the Emma Bridge, the one connecting Punda and Otrabanda is open, a ferry service free of charge will bring people from one side to the other. Renting a car allows for a little more mobility and major international rental car companies in addition to some local ones offer their services. Utilities Curaçao gets its water from the sea. The world's largest desalination plant is located here and produces delicious tap water. In houses there is no hot or cold water, just the water, and its temperature depends on how strong the sun is. Electricity here is a bit of a specialty. The current is officially 127 volts and 50 hertz, but the voltage can fluctuate and sometimes burn transformers. It's best to use some multi purpose transformers that are made for this current. Some appliances such as refrigerators need special transformers. Houses usually have the above current in addition to 220 volts, mainly used for air conditioners, washing machines, etc. Water and electricity may drop out on occasion. For cooking, every house has gas bottles to operate stove and oven. This page has been created in August, 1996 by Attila Narin <attila@narin.com> and was last updated on February 3, 2004. Copyright © 1996-2004 Attila Narin. All Rights Reserved.